King Felipe and Queen Letizia of Spain are making a three day state visit to Argentina on March 25-27. 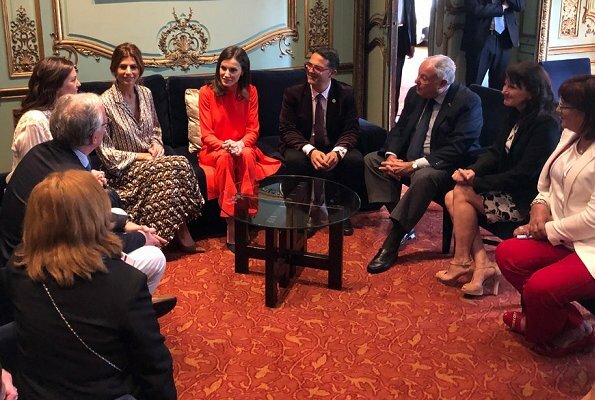 On the second day of their visit to Argentina, on March 26, King Felipe and Queen Letizia of Spain attended a meeting with members of the Spanish Community at La Rural Convention and Exhibition Center in Buenos Aires. 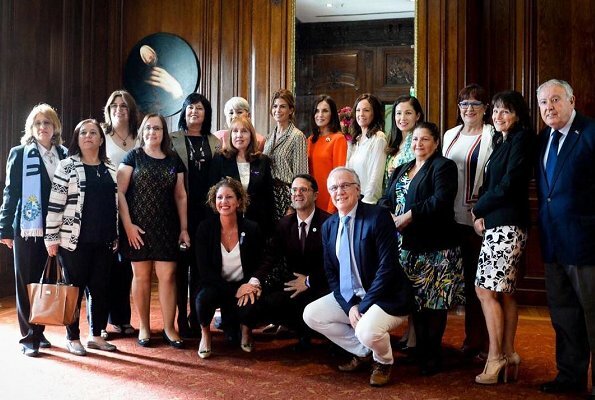 Also, Queen Letizia and Argentina's First Lady Juliana Awada attended a meeting with members of ALIBER – Iberoamerican Alliance for Rare Diseases at the Four Seasons Hotel in Buenos Aires. 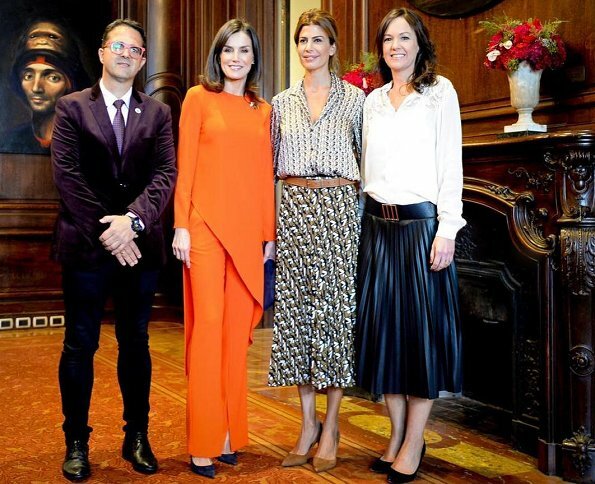 Queen Letizia wore a new outfit (trousers and top) by Zara. Letizia look is great. I love her outfit, the color, the fit, her hair (so much better than last night's. Juliana's hair is a little too casual and I'm not a fan of the print she's wearing, but no matter, they both look fabulous. It’s wonderful to see these two together. There’s such genuine warmth between them. I love both outfits too. They’re stylish, interesting, and suit the wearer very well. Lovely red outfit. Fumy that they are both dressed by Zara but I like both outfits. Juliana looks like such a warm person who gets along with all dignitaries. She looks fabulous hear, the prints are perfect. 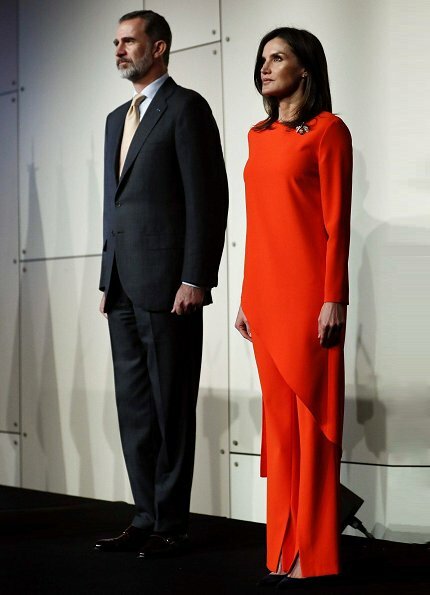 Letizia in red always works but the outfit need a little more structure and maybe a more prominent purse. The top is a little shapeless. 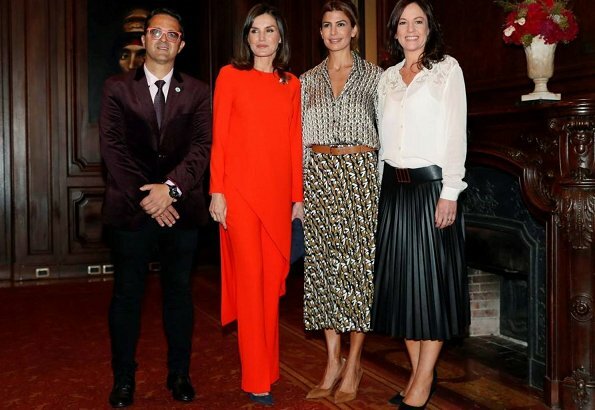 What an ultra chic outfit on Letizia. From the cut of the jacket to the front hem element on the pants. This is one of my favorites on Spain's queen, gorgeous! Sisters in beauty and much more. Both fantastic and low cost!! Letizia's outfit is the go to tunic, modern, slim, and sophisticated, althouit looks red is actually more orange, love that she chose blue shoes and bag. Juliana looks chic and she can carry this type of prints like nobody else, the hair is superb, and the smile a total winner. First lady looks so lovely. 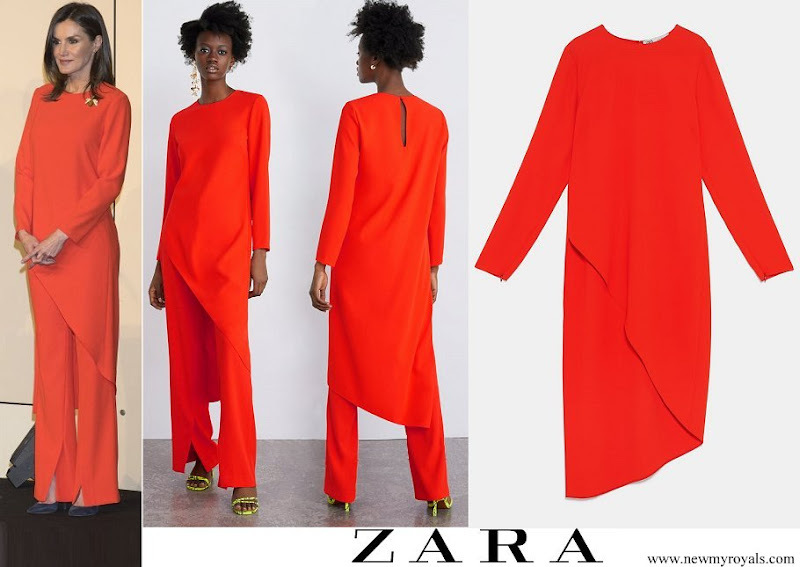 Funny that they were both wearing something from Zara. 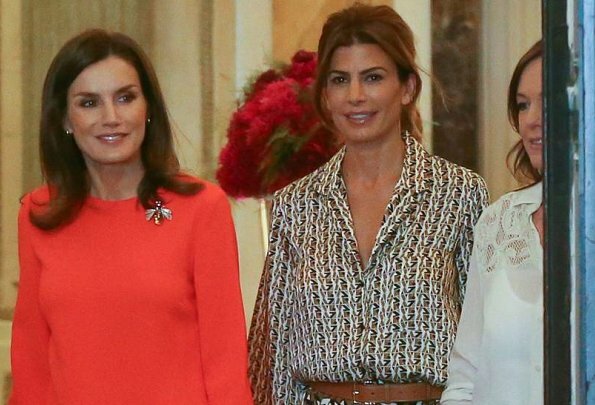 The brooch was a gift from the Dominican First Lady, Candida Montilla, when Letizia visited the country last year. It comes with matching earrings. Thanks for the information, I was so excited to see the brooch that I didn't even mentioned... this is the perfect piece to add interest to any outfit, modern and just the right size for the outfit. You're welcome, Cherry. The brand is called "Joyas Criollas" and it is settled in Santo Domingo,since 1979 all handmade by amber. 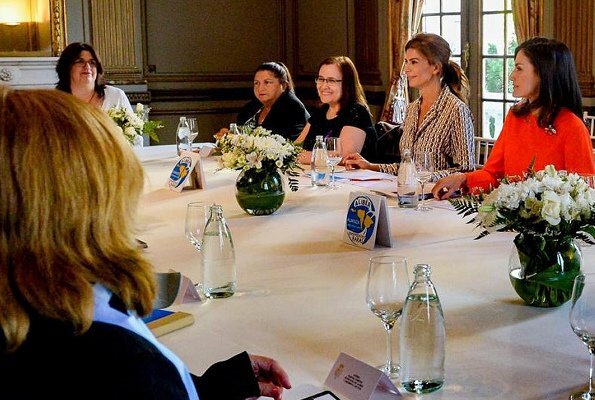 ¡¡Ahhh, Letizia lleva UN BROCHE!! 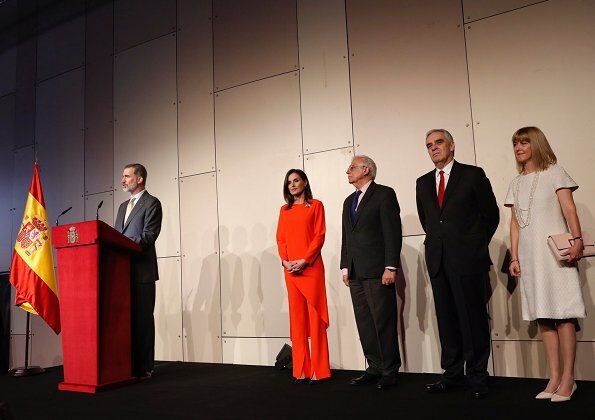 :)) El conjunto rojo es impactante, vanguardista y rompedor, muy Letizia, me encanta. El estampado de la Sra Awada no me gusta, está abarrotado y es un poco mareante. Su peinado tampoco está cuidado. Pero ella es una mujer encantadora, indudablemente. I love both of these outfits. Letizia has done a perfect job with a monochromatic look. So often it can be boring, but this has interesting detail. It is designed well so we can see enough of her pants to see her shape, not see her swimming in fabric. The brooch is the perfect finishing touch. Bravo! Juliana's outfit is a winner. The prints compliment each other beautifully. Her hair is styled so attractively!